It may be August, but if you are anything like me, your face is still unfortunately pale... thank you for that San Francisco. To tell you the truth, my lack of tan has more to do with my fear of wrinkles and less to do with the weather. So is the source of my makeup obsession, bronzer! Go ahead, fake a tan and and use a bronzer to get a sun-kissed glow. Avoid looking like a Jersey Shore cast member by finding the correct shade of bronzer for your skin tone. Dior makeup artist Ricky Wilson says the key to finding a believable face bronzer is matching the color to your decolletage. Makup artists also recommend concentrating the majority color on cheeks and brow bones with lighter doses along your nose and chin (and always blended into your neck). 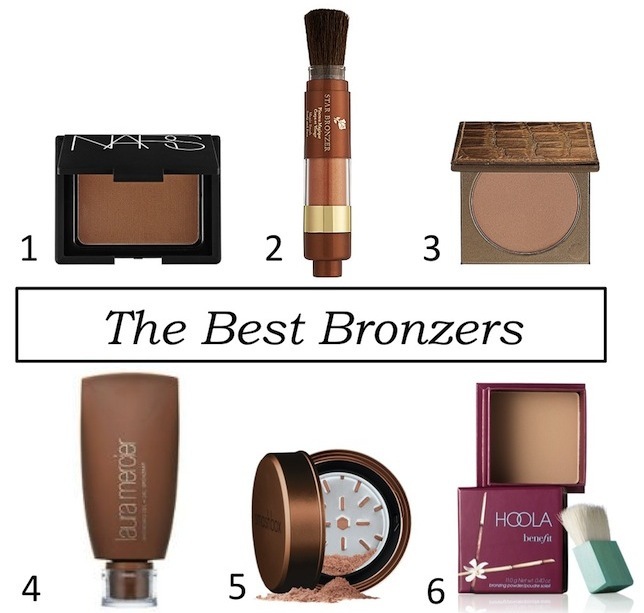 For more tips on finding and applying bronzer see here and here. So, whether you want to look like you have actually stepped out of your office this summer, or you're a year around pale gal like me, bronzer is a makeup bag must! 1. Nars Bronzing Powder, $36: I swear by Nars bronzing powder in Laguna - it is natural and flattering and has just a touch of believable glow. I also have the bronzer/blush duo which I keep in my work makeup bag at all times! 2. Lancome Star Bronzer, $33: Talk about convenience, this portable bronzing brush makes touch ups on the go a flash. This color looks great on olive and medium skin tones. 3. Tarte Matte Waterproof Bronzer, $29: For those who want to look their best even when playing in the pool, Tarte's waterproof bronzer is the solution. Mineral pigments are long lasting and are also great at withstanding humidity. 4. Laura Mercier Bronzing Gel, $32: This buildable liquid bronzer goes on with ease (is non greasy) and can even be used to adjust winter foundation that is now too light for your tan. PS- I also heard Laura Mercier's body bronzer is fab! 5. Smashbox 'Halo' Hydrating Perfecting Bronzer, $39: Oompa Loompas be gone! Smashbox Halo gives a dark tan bronze without any orange undertones. Reviewers also rave that it really does help even overall complexions. 6. Benefit Hoola, $28: Look like you just returned from a trip to Hawaii with Hoola, which gives a great dose of matte tan color. The brush it comes with is super convenient, but be careful because it goes on heavy if you load it up much. Nars makes my absolute favorite bronzer although I also like Guerlain's a lot. I have never tried Guerlain - I'm going to check it out. Thanks! My favourite thing about summer are all of the gorgeous bronzey shades! I still need to try hoola- I've heard amazing things! I've used it before. It is great although I'm too pale for it at the moment.